Members of the St. Boniface Hospital resuscitation team use a mannequin to practise techniques to revive a heart attack patient. Medicine, according to Dr. Tamara McColl, is a team sport. And just like the squads that play football or hockey, medical teams that practise together tend to have a much better chance of success than those that don't. "There's no one individual who is going to save the day," says McColl, who works in the Emergency Medicine Program at St. Boniface Hospital. "It's the team that saves the day. And if the team doesn't work cohesively as a unit, if we don't focus on those team performance and team dynamics aspects, we're not going to achieve a positive result." That message is taken very seriously by McColl's resuscitation team at St. Boniface Hospital. Every month, the team - comprised of physicians, residents, medical students, nurses, health-care aids, respiratory therapists and other professionals - gets together to hone their life-saving skills by simulating the real life-and-death situations that occur in hospitals every day. 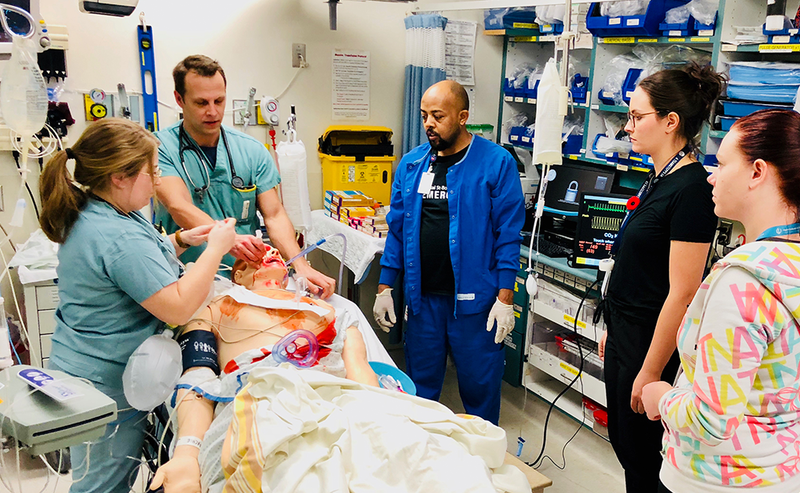 The simulations focus not just on protocols and procedures, but on creating the culture of safety and inter-professional collaboration necessary for high team performance in acute, chaotic resuscitations in the emergency department. "It's not just the medical information and procedures," says McColl. "It's practising things like teamwork, leadership, communication and task prioritization. Our simulations offer a unique opportunity to train, educate and prepare our emergency staff in a non-punitive environment without posing any threat to patient safety. It's really an amazing, experiential method for education and team building." The resuscitation team's commitment to promoting quality care and patient safety has not gone unnoticed. The group was recently named one of three finalists in the Region's annual Promoting a Culture of Safety contest. Other finalists in this year's competition, sponsored by the Manitoba Institute of Patient Safety, include an initiative to establish site-wide team safety huddles at Victoria Hospital and a decision to create service plans for mental health patients across the Region. Contest winners were celebrated during Quality and Patient Safety Week, a national event held every year from Oct. 29 to Nov. 2. Kerstin Jordan, Director of Patient Safety for the Region, says the annual competition represents an opportunity to share successes and to spark ideas about patient safety throughout the health-care system. "Our front-line employees know our patients and families best because they have the most interaction with them, so they are often in the best position to understand how improvements can be made," says Jordan. "When front-line staff develop these ideas, they're translating their concern for quality and patient safety into practice. It's important to celebrate their efforts and success." Members of the Victoria Hospital safety huddle discuss potential issues at a morning meeting. McColl says the underlying concept of the St. Boniface resuscitation team's simulation is not unlike a Winnipeg Jets practice. "Patrik Laine doesn't become an excellent goal scorer based solely on his natural gifts or the skills he's learned during his career," she explains. "He practises with his teammates. And we're trying to instill the same culture in our resuscitation team. We're well-educated, knowledgeable people, but there's always more to learn and always something we can improve upon and do better." The simulations are based on real-life situations. One scenario involves a heart attack patient (represented by a mannequin) presenting to the emergency department in shock. "The 'patient' went into cardiac arrest, and the team had to revive him," says McColl. A second case involves a breast cancer patient who arrived with shortness of breath and low blood pressure. "It turned out she had a blood clot, went into cardiac arrest, and we had to revive her using some special techniques, including administering medications to break up the clot," says McColl. An upcoming simulation will include working on patients under the influence of methamphetamine, an illegal, addictive and dangerous drug that is becoming all too popular on Winnipeg streets. "That scenario is aimed at getting our group more prepared for dealing with meth patients, because it's becoming a bigger problem in our emergency department and across the city," says McColl. That simulation will likely involve treating someone who is aggressive and violent. Team members will use techniques to de-escalate the situation, including the possibility of physical and chemical restraint in order to ensure the safety of the patient, staff and others in the emergency department. "It's a prime opportunity to be able to trial and practise our protocols for this kind of scenario before they are launched in the coming weeks," says McColl. Other finalists in this year's patient safety competition also emphasize team work in their approach to delivering care. 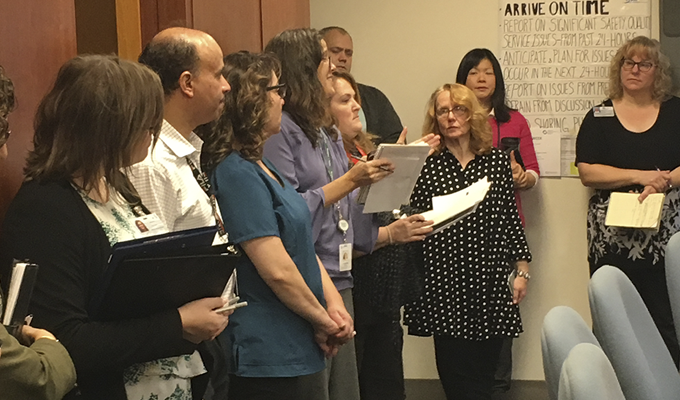 At Victoria General Hospital, for example, staff have been participating in "safety huddles" in which members from more than 40 different clinical and support areas meet at 9 a.m. every day for a quick roundtable focused on reporting and addressing patient safety issues. "On average, we meet for nine minutes, and for no more than 15 minutes, to report on safety and quality issues that occurred in the past 24 hours and to anticipate any issues that may occur in the next 24 hours," says Tamara Coombs, Quality Manager at Victoria. While patient flow huddles involving clinical staff were already taking place in the hospital, these new safety huddles also include those working in areas such as the lab, food services, pharmacy, volunteer services, spiritual health, rehabilitation services, security and housekeeping. 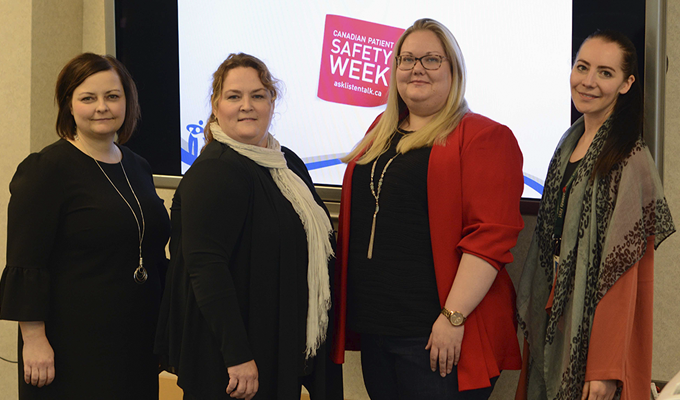 Kerstin Jordan (left) with representatives of this year's award-winning patient safety initiatives, from left: Tamara Coombs, Tamara McColl and Erika Hunzinger. "All roles have an impact on the patient experience, Coombs says. "I think patients would identify staff such as health-care aides and housekeeping staff as key people in their care and someone who should be around the table to discuss their care and safety." That fact was reinforced recently when a member of the housekeeping staff was on a break and noticed what she thought might be a patient getting into a cab. She astutely took down the cab number and reported it right away. As it turns out, the patient was "absent without leave" and the employee was recognized with a special safety certificate for alerting hospital staff to the patient's unscheduled and unauthorized exit. The incident highlighted the "all hands on deck" approach necessary to help ensure patient safety. Coombs adds that, on average, 10 to 12 safety issues are raised in the safety huddle every day. Each is logged for tracking purposes. "If it goes on the issue log today, you'll be asked tomorrow whether the issue has been addressed or is ongoing. That's really raised the urgency and accountability for safety. An issue isn't going to languish," Coombs says. The huddles, she adds, were launched following a survey that asked staff for their viewpoints on the hospital's quality and safety processes. Respondents agreed that teamwork is important for quality and safety, but a majority indicated that teamwork needed to be improved upon with respect to how quality and safety issues were being addressed. "There were instances where people felt alone in addressing issues, and now they have 39 other areas that can offer assistance," Coombs says, adding that the huddles are a respectful, safe place to share ideas and information. "They're aimed at awareness, making sure people are aware about what's happening and reporting concerns. Safety research tells us that communication issues exist in 80 per cent of adverse safety events, so better communication is never a bad thing. And in a day and age of cell phones and computers, bringing that human element back to the workplace helps improve employee engagement as well." The human element also has a role to play in a new initiative involving the development of individualized service plans for adults with mental health concerns. "A service plan is basically a brief, two-page summary of an individual, usually one who is using mental health crisis services on a regular basis," explains Erika Hunzinger, Clinical Specialist with the Region's Adult Mental Health program. "It will include the reasons they typically use these services, what their strengths are, risk factors that staff need to be aware of, the individual's coping strategies, along with their feedback on what is helpful and not helpful for them. I write it with their words, share it with them, and they can make changes. So they know exactly what's in it. It's very transparent." The mental health plan is similar in nature to the emergency co-ordinated care plan (ECCP) pioneered by the Region's Emergency Medicine Program about 10 years ago. Spearheaded by the adult emergency team at Health Sciences Centre Winnipeg, ECCPs cover a variety of care issues for patients who may have complicated medical conditions, complex mental health concerns, or who could be described as vulnerable persons. ECCPs can be initiated by any member of the emergency team, and can involve emergency staff, other acute-care providers, community services, the patient and their family or support persons as appropriate to the needs of the individual. When completed, the plans are used to inform how best to manage the care needs of the patient as soon as he or she arrives at any hospital emergency department. Like ECCPs, mental health plans are written when the individual patient in question is not in crisis. As Hunzinger explains, the plans are usually developed during a meeting with the patient and his or her designates. "Family can come, a community mental health worker could be involved, a Winnipeg Police officer, foster parents . . . whoever the individual wants on their team," says Hunzinger. "Oftentimes, there may be one family member and one service provider. Sometimes, they don't want anyone else involved, which is fine. But the individual always knows what's written in their plan." The plans are proving themselves a valuable asset for both individuals and mental health-care staff. "The hard thing about crisis services is that, like an emergency department, we're providing service 24 hours a day. That often means that the person will be seeing a different staff member every time they come." That can be difficult for individuals, Hunzinger says, especially if they struggle with trust issues, if they've experienced trauma before in the health-care system, or if there are differing approaches to their treatment. The service plans have helped staff stay true to the individual's hopes and expectations as they relate to service planning, and helps guide them in approaching the individual in a consistent manner. The service plan also helps staff identify when a new approach may be required, Hunzinger says. "Even people who come to us often will sometimes go through a crisis that warrants a different intervention. The details in the plan can help us see that this isn't a typical presentation, and that a different kind of intervention may be required." The plans have been in use since the spring of 2017, with more than 50 active care plans currently on file. "Now that we've been doing them for more than a year, we can see the positive impact," Hunzinger says. "What's been especially gratifying for me is that the individuals who have taken part in this initiative have expressed satisfaction about being able to share what they feel has been helpful or not helpful in their treatment. The individual feels valued, and the plan gives staff some direction so they don't feel like they are starting from scratch. That's great for the individual, too. No one wants to have to repeat themselves each week when describing their circumstances." Each plan is a "living document" that's tailored to the individual and which changes over time as circumstances and preferences change, Hunzinger says. "It's very individualized," she says. "There are no two people who have the same plan. Two people may come in with suicidal ideation, for instance, but the clinical approaches that work for each of them might be significantly different, and we need to respect that. The individual struggling with the symptoms often knows which approaches work best for them. It's a very collaborative and transparent process."